It was one of these people. As you might expect, this post contains spoilers for the most recent episode of Game of Thrones. When you play the game of thrones, you win or you die, and those who take the latter path rarely enjoy the send-off they deserve. Ned Stark gave up his fabled honor and got his head chopped off for his trouble. His son Robb begrudgingly attended his uncle’s wedding and received the world’s worst party favor. Margaery Tyrell realized something was rotten in the Sept of Baelor, but was blown up before she could do anything about it. It’s a sign of how much Game of Thrones has mellowed this season, then, that Sunday night’s big death didn’t come with any splattered blood or decapitated heads. When Jaime Lannister marched into Highgarden at the end of “The Queen’s Justice,” Olenna Tyrell’s fate was as good as sealed. We’d just seen Cersei’s brutal revenge on Ellaria Sand, who’d poisoned the little-seen Myrcella back in season five — surely the Lannisters would offer a similarly gruesome death for the woman who’d needled them for three seasons and masterminded the plot to kill Joffrey, the Lannister child who’d actually had screentime. But instead, Olenna got to go out the way she lived: in an absolutely cracking two-handed dialogue scene. Since her introduction in season three, the Thrones writers have enjoyed throwing actress Diana Rigg into a room with anyone else in the cast and seeing what came out of it. She was up for the challenge: Whether Rigg was sparring with Charles Dance, Jonathan Pryce, or Lena Headey, the result was always delightful. On Sunday, she got to go up against Nikolaj Coster-Waldau in a scene that was one of the best of this young season. Olenna didn’t fight her fate — as soon as Jaime walked into the room, she knew she wasn’t leaving it alive. The last living Tyrell approached her death with a mix of resignation and defiance. She spit harsh truths, advising Jaime that Cersei was a “disease” he’d soon regret helping spread. And she kept her dignity until the end, downing the poisoned wine in one long gulp — a moment that was reminiscent of Margo Martindale’s death in Justified — then using her final moments to taunt Jaime over Joffrey’s death: “Tell Cersei, I want her to know it was me.” If Olenna Tyrell was going to go out, she was going to go out on her own terms. It was not the most shocking Game of Thrones death, and it was not the biggest Game of Thrones death, but it may have been the quietest Game of Thrones death. 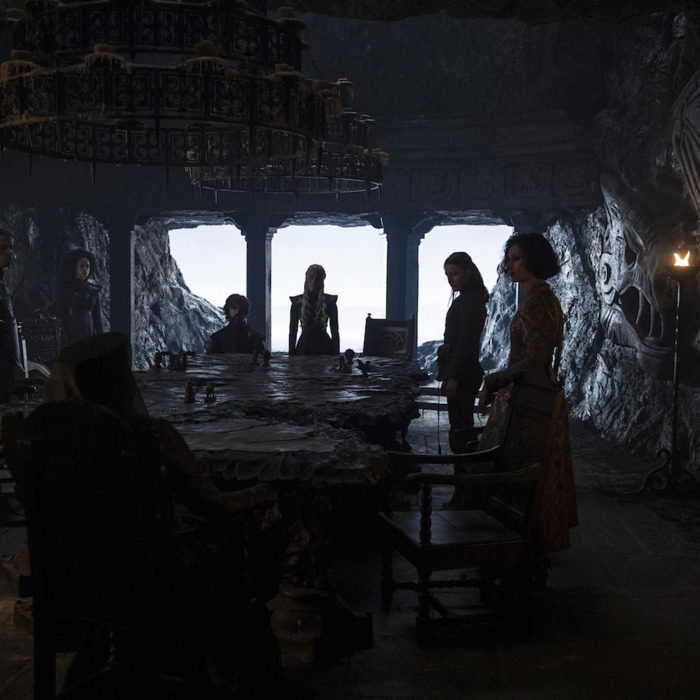 Alongside season seven’s brisker pace and more adventurous editing, it’s proof that this show’s not too old to try something new — a lesson Olenna Tyrell might approve of. Is It Gross to Ship Jon and Daenerys?